Clipper was named after the first fast traveling ship built to carry merchandise from Asia to America. 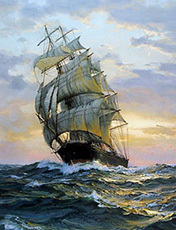 The Clipper’s ship masts carried more sails than any other ship that had been built by that time. It was designed to carry cargo over long distances at high speeds. The long lines of the ship combined with the enormous driving power of the sails allowed the ships to “clip” along at speeds that earlier generations of sailors never dreamed of. “It represents my style. No matter what obstacles we always move forward, reach our destination, and deliver what we promised,” said Lina Hu, Founder, Chairman and CEO of Clipper Corporation.